The dictionary defines community as a feeling of fellowship with others, as a result of sharing common attitudes, interests and goals. This is exactly what I found the first time I stepped out of my comfort zone and volunteered to serve at my first Community Table. 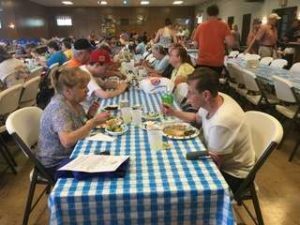 As I stood scooping salad out into bowls at the end of the food line, I began to see that this event was about much more than providing food to those in need. The meal was plentiful and 71 families left with full bellies and bags full of groceries but it was the atmosphere of love that truly took the spotlight. Those who served food did so with a smile, children helped their elders through the line and many volunteers floated about the room engaging others in lively conversation. I was inspired by the woman standing next to me. While I forget her name, I will never forget how she greeted almost everyone by name and blessed each and every person as they passed by. The goal of the event was simple: feed those who are hungry. However, any outsider looking in would have been overwhelmed by the love and compassion that turned scores of individuals from many different backgrounds into a family for the night. I am truly grateful to have been a small part of the Community Table and encourage others to consider joining in for the next one. 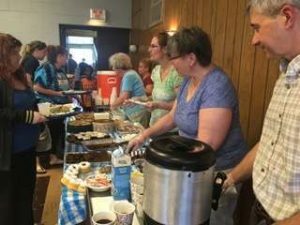 Community Table – Wonderful Opportunities to Serve!